"America First: Tell Congress to WITHDRAW the United States from the United Nations!" Mr. President, I love and pray for you every Day! If you don't do something about the public schools, America will not stand a chance! Our children are being brainwashed into progressive mindset from kindergarten thru college! While you are working to help the !world, The liberals are quietly turning millions agains t America every DAY! ! !They are winning! victor h. from Dearborn, MI signed. Molly C. from Springboro, OH signed. We should immediately withdraw from the UN and give the other members 30 days to leave. Should have been done years ago. Membership in the UN equates to loss of the USA in all but name. UN mandates prevent US liberties and US sovereignty. It is actually the big government nightmare called NWO fascism masquerading as the great protector of human rights. World governance via the United Nations is over reaching its intended purpose and is a threat to the sovereignty of the United States and its citizens. Redistribution of wealth from the United States to the rest of the world is not in the best interests of our free society, through corrupt back room deals made without our Congressional debate and approval. 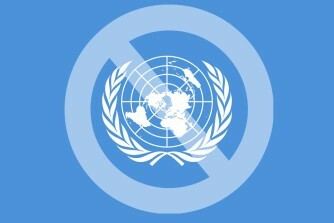 We do not need the UN. We are a country capable of making our own decision. Get out of the UN. We are wasting our time and money. That money could be put to better use. Wilbert W. from Hubbard, OH signed.